The relaxed yet stylish nature of this collection makes it versatile for many room settings. The chic style comes from the tapered block feet and easy going track arms which blends well with the more formal and stylish loose pillow back and nail head trim. 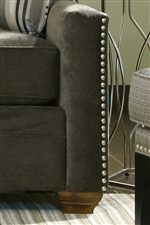 Your living room will benefit from the great character of this collection no matter how you choose to use it. Browse other items in the 7335 collection from AHFA in the area.